Shakespeare was involved in many aspects of London’s professional theatrical world. He was an actor, a playwright, and a shareholder in an acting company known as the Lord Chamberlain’s Men, which became the King’s Men when James I became king in 1603. His plays were performed on professional stages owned by his company--first the Theatre, and then, after 1599, the Globe. (After a property dispute, the Theatre was disassembled and the timbers used to build the Globe). In 1609, his company began using its own indoor theater at Blackfriars. His plays were performed in many other spaces, including the royal court, the universities of Oxford and Cambridge and the Inns of Court, public buildings and outdoor spaces in the provinces, and private households. The total number of Shakespeare’s plays varies somewhat, depending on who is counting them, and how. The total shifts between 38 and 40 plays as scholars reassess references to his two lost plays--Love’s Labor’s Won and Cardenio--and analyze how large a hand he had in some collaboratively-written plays. 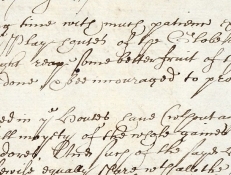 This category includes all publications of his plays, up to and including the First Folio in 1623; all entries for his plays in the Stationers' Register; administrative documents from the National Archives and elsewhere that make reference to his theaters and theater companies; and printed and handwritten references to seeing and/or reading his plays. 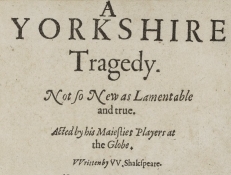 Read Alan H. Nelson's thematic essay to learn more about lawsuits in Shakespeare's England. 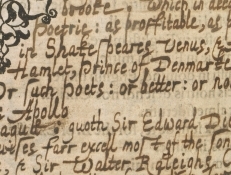 Visit the British Library's Shakespeare in Quarto, to learn even more about actors, playhouses and theater companies in Shakespeare's time, and to view completely digitized copies of Shakespeare's plays. 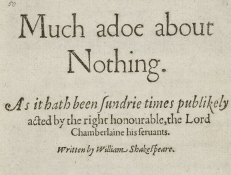 A Midsummer Night's Dream was entered into Liber C of the Stationer's Company on October 8, 1600. The Merchant of Venice was originally entered into Liber C of the Stationers' Company on July 22, 1598, and licensed to James Roberts. 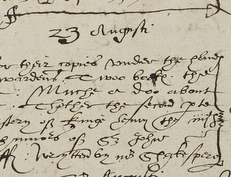 Stationers’ Register entry for As You Like It, Henry V, and Much Ado About Nothing "to be staied"
On August 4, 1600, Henry V, Much Ado About Nothing, and As You Like It (along with a fourth play not authored by Shakespeare, Every Man in His Humor) were noted on the flyleaf of Liber C of the Stationer's Company. This is the first edition of Henry IV, Part 2, printed in 1600 by Valentine Simmes for Andrew Wise and William Aspley, who entered it into the Stationers’ Register on August 23, 1600, along with Much Ado About Nothing. The first edition of Henry V, shown here, was printed in 1600 by Thomas Creede for Thomas Millington and John Busby. 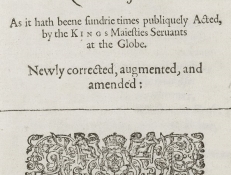 Englands Helicon, a collection of poetry first printed in 1600 by John Roberts for John Flasket, includes a sonnet from act 4, scene 3 of Love’s Labor’s Lost (1598). The poem in Englands Helicon is ascribed to “W.